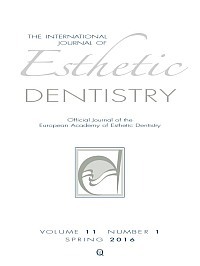 Editorial: "Many roads lead to Rome"
A minimally invasive prosthetic procedure (MIPP) for the esthetic rehabilitation of the complete arch advocates the preservation of enamel to optimize the adhesive bond of the luting agent to both the tooth surface and the etchable ceramic restoration. When esthetic rehabilitation of a worn dentition is required, a MIPP can be selected to reduce the biological cost of removing additional enamel tooth structure. The fundamental steps to achieve this goal are to: (1) increase the vertical dimension of occlusion (VDO); (2) reduce the thickness of the monolithic ceramic material; (3) preserve the enamel during tooth preparation; and (4) adhesively bond the etchable ceramic restorations. This article presents a comprehensive, minimally invasive prosthetic treatment approach for the esthetic rehabilitation of a severely worn dentition using a lithium disilicate all-ceramic material with partial and complete coverage restorations. Due to an increasing awareness about dental erosion, many clinicians would like to propose treatments even at the initial stages of the disease. However, when the loss of tooth structure is visible only to the professional eye, and it has not affected the esthetics of the smile, affected patients do not usually accept a full-mouth rehabilitation. Reducing the cost of the therapy, simplifying the clinical steps, and proposing noninvasive adhesive techniques may promote patient acceptance. In this article, the treatment of an ex-bulimic patient is illustrated. A modified approach of the three-step technique was followed. The patient completed the therapy in five short visits, including the initial one. No tooth preparation was required, no anesthesia was delivered, and the overall (clinical and laboratory) costs were kept low. At the end of the treatment, the patient was very satisfied from a biologic and functional point of view. Direct posterior restorations represent a widespread procedure in daily practice. Occlusal layering is often considered a complex task, generally not predictable and often requiring several occlusal adjustments. Moreover, direct posterior restorations are time consuming, as many small increments must be applied and cured individually to control shrinkage stress. Several authors have proposed different material layering techniques for posteriors. The authors of this article propose a simplified approach, which primarily aims to help the clinician perform quick, simple, predictable, and natural-looking occlusal modeling, reducing the need for occlusal adjustments. Objectives: To assess the influence of conventional glass ionomer cement (GIC) vs resin-modified GIC (RMGIC) as a base material for novel, super-closed sandwich restorations (SCSR) and its effect on shrinkage-induced crack propensity and in vitro accelerated fatigue resistance. Methods: A standardized MOD slottype tooth preparation was applied to 30 extracted maxillary molars (5 mm depth/5 mm buccolingual width). A modified sandwich restoration was used, in which the enamel/dentin bonding agent was applied first (Optibond FL, Kerr), followed by a Ketac Molar (3M ESPE)(group KM, n = 15) or Fuji II LC (GC) (group FJ, n = 15) base, leaving 2 mm for composite resin material (Miris 2, Coltène-Whaledent). Shrinkageinduced enamel cracks were tracked with photography and transillumination. Samples were loaded until fracture or to a maximum of 185,000 cycles under isometric chewing (5 H z), starting with a load of 200 N (5,000 X), followed by stages of 400, 600, 800, 1,000, 1,200, and 1,400 N at a maximum of 30,000 X each. Groups were compared using the life table survival analysis (α = .008, Bonferroni method). Results: Group FJ showed the highest survival rate (40% intact specimens) but did not differ from group KM (20%) or traditional direct restorations (13%, previous data). SCSR generated less shrinkage-induced cracks. Most failures were re-restorable (above the cementoenamel junction [CEJ]). Conclusions: Inclusion of GIC/RMGIC bases under large direct SCSRs does not affect their fatigue strength but tends to decrease the shrinkage-induced crack propensity. Clinical significance: The use of GIC/ RMGIC bases and the SCSR is an easy way to minimize polymerization shrinkage stress in large MOD defects without weakening the restoration. The Octagon Model is a clinical assessment tool designed to assess marginal tissue recession (MTR) and estimate the level of difficulty in achieving root coverage. It evaluates eight patient- and siterelated factors: patient's expectations, smoking status, width of keratinized tissue, absence/presence of cervical lesion, interproximal soft tissue/bone level, depth and width of recession defect, and buccal bone thickness. The model is presented in a three-colored diagram to facilitate communication between clinicians and between clinicians and their patients, and to assist clinicians in optimizing treatment plans at both site and patient levels. Purpose: To assess the repeatability and accuracy of three dental color-matching devices under standardized and freehand measurement conditions. Materials and methods: Two shade guides (Vita Classical A1-D4, Vita; and Vita Toothguide 3D-Master, Vita), and three color-matching devices (Easyshade, Vita; SpectroShade, MHT Optic Research; and ShadeVision, X-Rite) were used. Five shade tabs were selected from the Vita Classical A1-D4 (A2, A3.5, B1, C4, D3), and five from the Vita Toothguide 3D-Master (1M1, 2R1.5, 3M2, 4L2.5, 5M3) shade guides. Each shade tab was recorded 15 continuous, repeated times with each device under two different measurement conditions (standardized, and freehand). Both qualitative (color shade) and quantitative (L, a, and b) color characteristics were recorded. The color difference (ΔE) of each recorded value with the known values of the shade tab was calculated. The repeatability of each device was evaluated by the coefficient of variance. The accuracy of each device was determined by comparing the recorded values with the known values of the reference shade tab (one sample t test; α = 0.05). The agreement between the recorded shade and the reference shade tab was calculated. The influence of the parameters (devices and conditions) on the parameter ΔE was investigated (two-way ANOVA). Comparison of the devices was performed with Bonferroni pairwise post-hoc analysis. Results: Under standardized conditions, repeatability of all three devices was very good, except for ShadeVision with Vita Classical A1-D4. Accuracy ranged from good to fair, depending on the device and the shade guide. Under freehand conditions, repeatability and accuracy for Easyshade and ShadeVision were negatively influenced, but not for SpectroShade, regardless of the shade guide. Conclusion: Based on the total of the color parameters assessed per device, SpectroShade was the most reliable of the three color-matching devices studied. Purpose: The harmonious shade matching of restorations with adjacent natural teeth is a prerequisite for a successful esthetic restoration. Color is a combined effect of the physical properties of an object, the light source, and the perception of the observer. The interpretation of color is influenced by both the physiological and psychological health of an individual. It is critical to understand the influence of an individual's psychological state on the shade selection procedure to achieve better shade matching and post-treatment patient counseling. The aim of this study was to evaluate the influence of personality on tooth shade selection capability. Materials and methods: Two porcelain fused to metal (PFM) discs were fabricated. A reference shade was determined using a spectrophotometer (Vita Easyshade, Vita). The personalities of volunteers were identified using a Myers- Briggs Type Indicator (MBTI) questionnaire. The volunteers visually identified the shade of the two PFM discs under a controlled light source. The mean color difference was determined between the visual and the spectrophotometer values. The data thus obtained was statistically analyzed with Kruskal-Wallis and post-hoc comparison tests to ascertain the difference between the groups. Results: The groups that performed better in tooth shade selection were ENTJ (2.923 ± 2.36), ISTJ (3.086 ± 2.56), ENFJ (3.197 ± 2.936), and ESTJ (3.431± 2.78). The groups INTP (9.383 ± 3.30), ISTP (9.133 ± 3.44), ISFP (8.737 ± 2.81), and INTJ (8.480 ± 3.35) showed poor tooth shade selection ability. The Kruskal- Wallis test showed lower mean rank for group ENTJ (89.75), followed by ISTJ (92.25), and ENFJ (94.80). Conclusion: Within the limitations of this study, it was concluded that there was a statistically significant difference between the different personalities with regard to tooth shade selection ability.